Check out the Floe Cargo Max Trailers! These are aluminum framed trailers with a lightweight Polymer bed! You can use it like a utility trailer to haul your ATV, or use it to haul a load of gravel or mulch and tilt the trailer to make unloading easy! The bed continues to be the real story. Formed from high-molecular-weight resins, the finished polymer bed is amazingly impact resistant…and strong. At 8-feet long and available up to 13' long, with the support of FLOE’s professional-grade aluminum frame, the CargoMax XRT 8' trailer yields a monstrous 1,800 lb. carrying capacity with the larger sizes holding 2,000 lbs. "That’s enough capacity to tow any ATV, not to mention deer stands and a couple big bucks to go with it,” says FLOE Chief Sales Officer Don VanderMey. The strength of the bed not only comes from its premium polymers, but also its intelligent design. The base of the bed is critically structured with longitudinal ribs to maximize strength and durability. And tucked in the depressions between those ribs you’ll find a series of integrated, collapsing tie-downs that connect directly to the CargoMax XRT’s robust, extruded aluminum frame. From frame-strength, the conversation shifts to suspension. 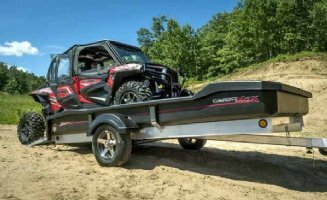 Whereas the garden-variety utility trailer offers only feeble leaf-springs, the CargoMax features full rubber torsion independent suspension to keep your driving pleasures peaked even when towing with a small car. CargoMax is the latest in utility trailer technology.